ULC has invested over $70 million in community real estate, leveraging $125 million in the development of affordable housing and nonprofit facilities. Our current master site and vacant land investments will generate an additional $500+ million of place-based community development. As part of continued community engagement, the final two phases of the Holly Square redevelopment were completed! ULC successfully constructed a new interim pocket park at the Thriftway site in Westwood and after land banking a site for six years in partnership with Colorado Coalition for the Homeless (CCH), ULC celebrated the grand opening of CCH’s newest development: Renaissance at North Colorado Station. ULC celebrated the grand opening of the Garden Court Apartments at Yale Station and received approval for the construction of a new elevator at the seven-story Mountain View Nonprofit Tower. Blake Street TOD at the Blake Station on the A Line was successfully up zoned to accommodate a 16 story development. ULC kicked off 2016 with the refinance of the Social Enterprise Foundry in Sun Valley and ULC was able to reduce debt expenses and budget $600k in capital improvements into four strategic properties due to favorable terms. After creating the Denver Shared Spaces program in partnership with the Denver Office of Strategic Partnerships and Piton Foundation in 2009, ULC successfully transitioned the management of the program to Radian Inc. In May, ULC hosted the national premiere of Arc of Justice, a documentary that tells the story of the country’s first Community Land Trust in Georgia. ULC signed a development agreement with Integral Group Inc for the multi-phase development of Artway North, Race Street TOD was successfully rezoned for residential and commercial use, and ULC and partners utilized 303 ArtWay’s arts and cultural components to promote increased social cohesion and address specific problems. As part of continued community engagement, the final two phases of the Holly Square redevelopment were completed! This includes the new Roots Elementary School which opened in August for the 2016-2017 school year. ULC has a 99 year land lease agreement with Roots to ensure the property will provide community benefit for generations. An outdoor overlook was also constructed with support from the Opus Foundation. This space will foster community gatherings as well as space for students and staff from Roots and the existing Boys & Girls Club. With support from Denver’s Office of Economic Development, Wells Fargo and Healthy Places Westwood, ULC successfully constructed a new interim pocket park at the Thriftway site in Westwood. 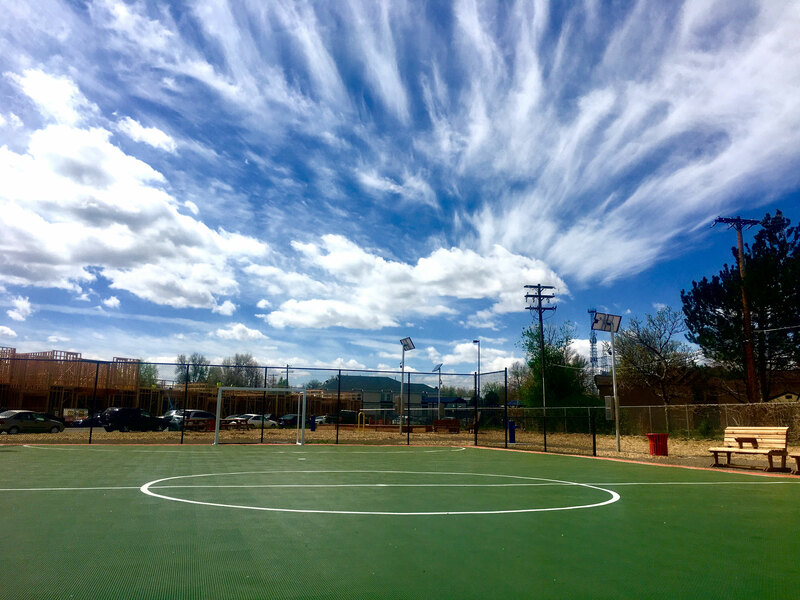 What was once a dangerous vacant building, is now a beautiful outdoor gathering space for community that includes a futsal court and walking path. ULC will work with the Westwood community to determine future permanent development opportunities for this site in the coming years. After land banking a site for six years in partnership with Colorado Coalition for the Homeless (CCH), ULC celebrated the grand opening of CCH’s newest development: Renaissance at North Colorado Station. Located near the 40th and Colorado rail station on the A Line, this 103 affordable unit development also includes space for supportive services to serve residents. Blake Street TOD at the Blake Station on the A Line was successfully up zoned to accommodate a 16 story development, making the opportunity for a high density mixed-use development a reality. ULC reached an agreement with Medici Development Group for the development of affordable housing as part of the overall site plan which will also include commercial and market rate housing options. ULC celebrated the grand opening of the Garden Court Apartments at Yale Station with development partners Koelbel & Co. and Mile High Development. These 66 units of permanently affordable housing also include a transit pass to support residents who are not able to rely on a vehicle. This site was originally purchased by ULC in 2010 using the TOD Fund. ULC received approval for the construction of a new elevator at the seven-story Mountain View Nonprofit Tower. This new ADA compliant elevator provides safer access to more than 1,000 individuals receiving services in the building each month. With support from the Denver Office of Economic Development and Office of Strategic Partnerships, ULC renovated the lobby and common areas, and ensured all restrooms were ADA compliant in this extensive renovation. ULC kicked off 2016 with the refinance of the Social Enterprise Foundry in Sun Valley. This was made possible with the Calvert Facility Fund and the Colorado Health Foundation’s additional $1M PRI investment at our Race Street TOD site. This allowed ULC to fully draw down the $10M fund in only 14 months and keep rent affordable to the four nonprofit tenants who work at the Foundry. Four other strategic properties were refinanced in 2016 using local banking partner MidFirst, including ULC’s first long term loans at the Tramway Nonprofit Center and the Mountain View Nonprofit Tower. Favorable terms allowed ULC to reduce debt expenses and budget $600k in capital improvements into the properties. After creating the Denver Shared Spaces program in partnership with the Denver Office of Strategic Partnerships and Piton Foundation in 2009, ULC successfully transitioned the management of the program to Radian Inc. This local community design services nonprofit organization (who ULC supported the creation of in 2012) will allow for the program to grow and evolve to better support nonprofits in the Denver region. In May, ULC hosted the national premiere of Arc of Justice, a documentary that tells the story of the country’s first Community Land Trust in Georgia. This catalyzed efforts to create additional CLTs in order to preserve affordability. ULC then identified support for the creation of a CLT Business Plan for the Globeville, Elyria, Swansea neighborhoods, which is a focus of work in 2017. ULC signed a development agreement with Integral Group Inc for the multi-phase development of Artway North, formerly known as Park Hill Village West. This transit oriented development (TOD) is located at the 40th & Colorado Station on the University of Colorado A Line Commuter Rail, and will include both mixed-income rental housing as well as commercial and community serving space. Future phases of development will complement the Park Hill Station Apartments, 156 units of affordable housing that were completed in 2016 by Delwest as phase one of this master site. Race Street TOD, a 6-acre property in the Elyria Swansea neighborhood, located only 2 blocks from the Western Stock Show redevelopment and the future North Rail Line Station, was successfully rezoned. This will allow a range of density from 3 to 5 to 8 stories for residential and commercial use. In January 2017, ULC selected Zocalo Community Development as the master developer partner for the 6-acre site, with a plan to build a mixed use and mixed income development that will include 80,000 sf of nonprofit/commercial space and 560 residential units, both rental and for-sale, with 58% being permanently affordable. ULC and partners utilized 303 ArtWay’s arts and cultural components to promote increased social cohesion and address specific problems. The art and heritage trail, planned to connect Northeast Park Hill, which has a history of gang violence and as a result, low public-safety perception, to the Greater Park Hill community. Creative visioning activities and surveys were used at public events to fully engage stakeholders in determining what should be highlighted along the proposed trail.